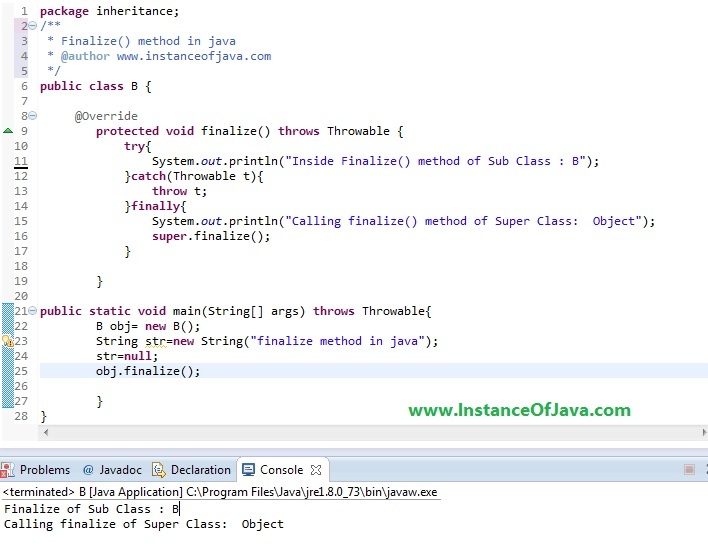 finalize() method pre defined method which is present in java.lang.Object class. finalize() method is protected method defined in java.lang.Object class. 1.What is purpose of overriding finalize() method? The finalize() method should be overridden for an object to include the clean up code or to dispose of the system resources that should to be done before the object is garbage collected. 2.How many times does the garbage collector calls the finalize() method for an object? 3.What happens if an uncaught exception is thrown from during the execution of finalize() method of an object? If we are overriding finalize() method then its our responsibility to call finalize() method explicitly. finalize() method never invoked more than once by JVM or any given object.